This is the runtime environment where your application executes. In Java world, it is typically a JEE Application Server such as WebSphere, WebLogic, JBoss or Tomcat. It also includes components like Web Servers (Apache, IIS etc), Caching proxys and the JVM. What can go wrong with it ? Your application will almost always depend on some sort of a backend system – a Database or a remote Web Service provider. The connectivity between your application and the Backend plays a crucial role in the stability of your application. Depending upon the remote system, there can be slew of configuration you may have to do on both the sides. In order to troubleshoot this subsystem, you may have to involve DBAs, Messaging Administrators and remote system’s engineers. Your application must run on a host, whether physical, virtual or in the cloud. The OS running on the host plays a very important role in the stability of your application. 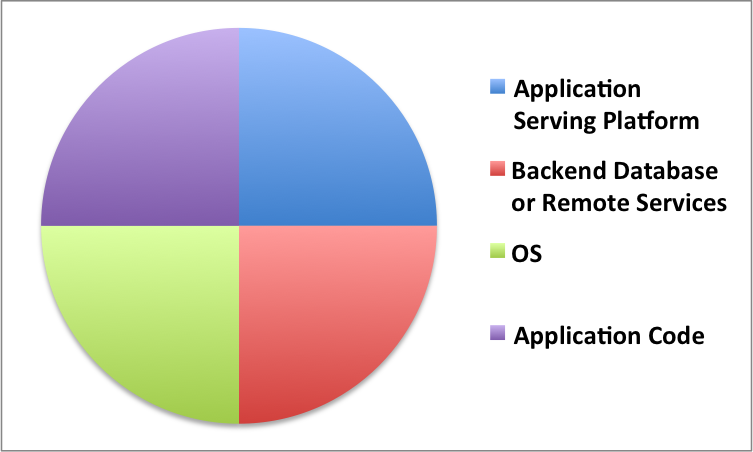 The most popular OS-es for hosting applications are Linux and Windows. Few other flavors of Unix, such as Solaris, AIX and HP UX are also heavily used. To troubleshoot issues in this subsystem you will need Systems Administrators (hopefully experienced ones) and possibly Storage Administrators. This is the bread and butter of your application. Developers write code, typically as part of a team and work with Middleware Administrators (or Release Engineers) to deploy the application in production environment. Code is logging too much/too little. There you have it. The 4 subsystems that can cause havoc in your application are Application Serving Environment, Backend Systems, OS and Application code. They all have equal changes of being the root cause of instability. While varied expertise is required to investigate issues at these subsystems, an Application support engineer has a unique opportunity to analyze all the 4 subsystems at a high level and arrive at a reasonable root cause. In the next few blog posts, I’m going to be talking to you about one of the most dreaded issues in Java. Java Memory. Can’t wait to show you. Next post: How to monior Heap usage of a Java Application ? Previous post: How to use AppDynamics to monitor performance of a Java method?